Interceptor 128/4633 first came into my life way back in 1986 or was it 1987. I finished school and went to my Dads shoe store, and I spotted it sitting in the car park out the back and wondered what the hell it was. 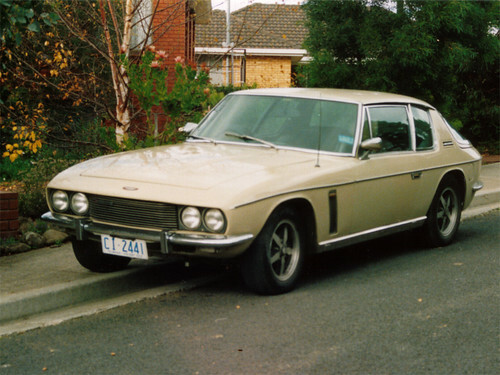 When I got inside and went to Dads office I saw a few back issues of he Interceptor, the Jensen Car Club of Australia’s magazine sitting on the bench. I asked about it and Dad said he had bought it. I spat it at him and said “What about the Falcon!” which I was told was going to be sold. 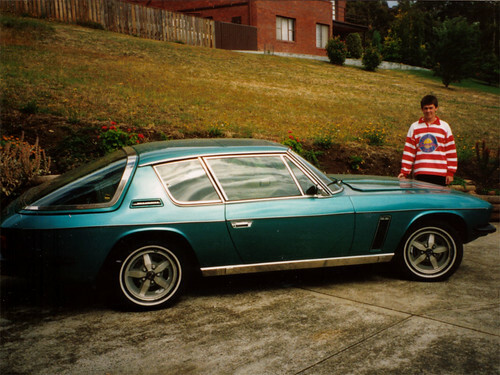 Dad had a blue XD Falcon S-Pack at the time, which I loved, for some reason. Probably because I had been learning to drive it on the sand flats at the beach. Maybe it was the sporty red pinstripe and fog lights. 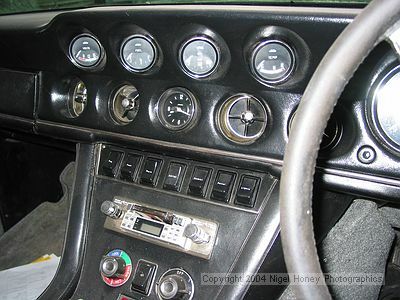 I told Dad I did not like the car, did not want it and that I loved the Ford and he could not sell it. Dads reply was simply “Don’t worry, you will love it.” I guess you could say he was correct there. The car was Oatmeal, a delightful 90s PC case shade of beige. 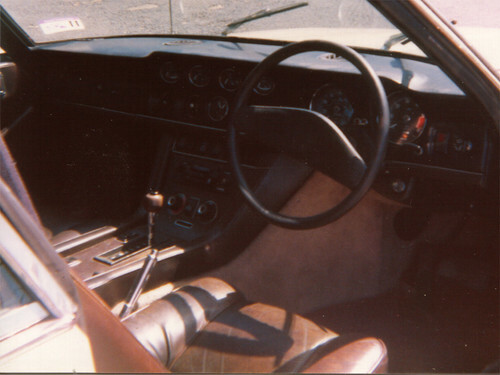 The interior was brown leather. Talk with Richard Calver a few years back revealed this car to be a very rare colour combination indeed, with only 12 cars being made in this combination, and that the leather is of “special order”. It does have an unusual grain, which has been hard to match, which will make repair difficult. 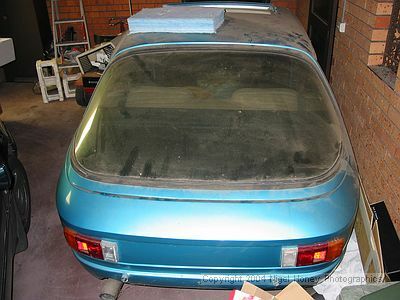 I have only ever seen a photo of one other car in this colour, and it is on the JOC website here, second photo from the bottom. The car had GB plates on the rear deck, and Charles Follett dealer plates on the sill panels, under the door. We have no idea when the car made its way to Australia. 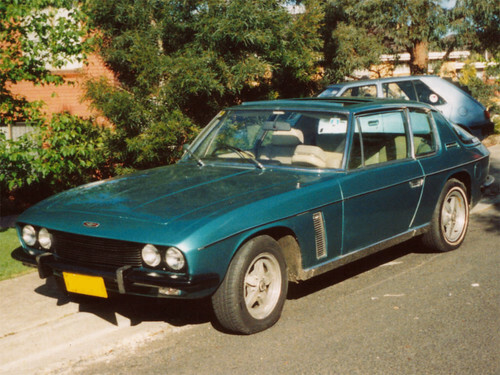 We do know that the car was in Oak Flats in New South Wales before coming to Tasmania, and was owned buy a guy called Richard Scobie. 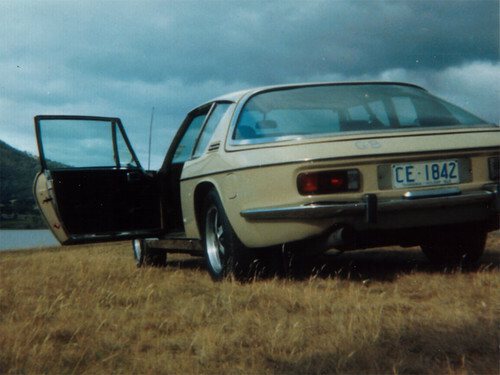 Here is a photo of the car taken in NSW, wearing old plates JMF-597. I have found this document, i guess this is a NSW Pink Slip? It is very hard to read, you can not make out the name of the dealership apart from “Motors Pty Ltd” however the address can be read and is 69 Victoria Rd Drummoyne﻿. Richard paid $13995 for the car and the odometer read 83390. The date was 23 January 1984. Interestingly they had listed the car as being a 1976 model. Here is an image from Google Streetview of the address of the dealership. Dad paid $12000 for the car. We put Tasmanian registration CE-1842 on it and the car was driven for a while as it was. 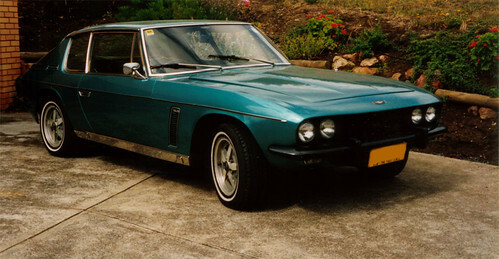 The Interceptor was used as Dads daily driver for some time, on the relatively short commute from our house to his shop. It was used also to carry tools in, and I remember a large step ladder and tool boxes being carried around in it on more than one occasion. During this period of daily use, Dad had taken the car to the tip to offload some rubbish, and pulled up along side a guy with a Dodge Phoenix. 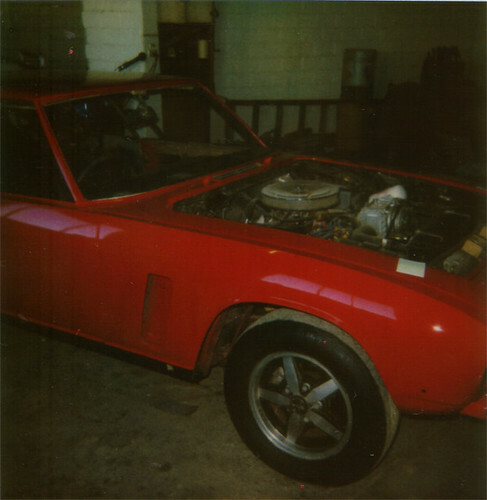 They got talking and it turns out the guy had a Chrysler 383 and Torqueflite 727 sitting in his shed. 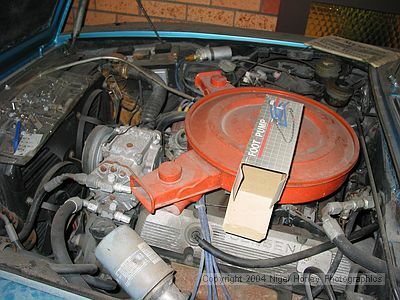 Dad bought them, rebuilt the engine (sadly I don’t know what specs he built it with and he can not remember) and dropped it in in place of the original motor and box, which are still sitting in his store room under the house. 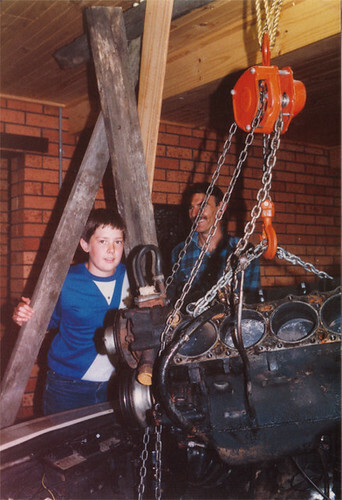 Check out the home made engine hoist! Lucky OH&S were not around to see this one… and yes, that is a young me in the photo. 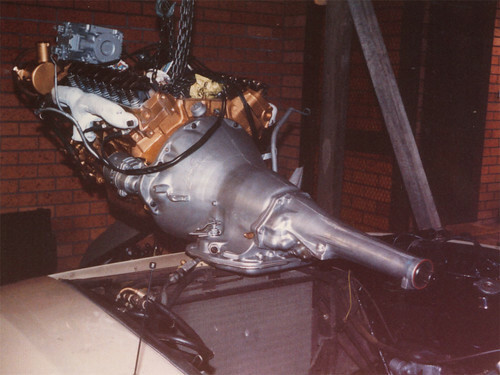 The car was then re-registered as CI-2441. 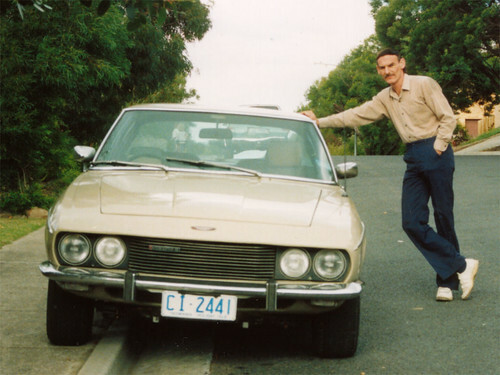 The car was used on and off for a few years after this, I have very fond memories of driving the car to school in the morning with my L-plates on the window, and then cruising around the streets of Hobart in it with my friends when I got my P-plates. 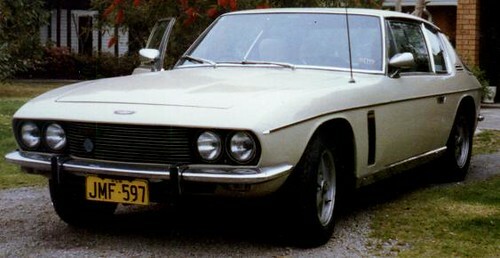 The last real use it got was when the Jensen Car Club of Australia had their national easter rally in Tasmania in 1995. It can just be seen in this photo, next to the white car, third from the right. At the far right of the shot is my Mum and Dad, and brother Richard, along with our Mercedes Benz 190E. Following this the car was laid up in Dads shed again, where it sat for 10 years. The car was driven back to my house and apart from nearly losing a rear wheel on the way home due to loose wheel nuts, drove exceptionally well. There was a little slipping in the gearbox bands but the brakes worked fine, the suspension worked fine, no grinding, crunching or creaking noises, which was good. In fact there was less suspension noise in the car than in my Subaru WRX. 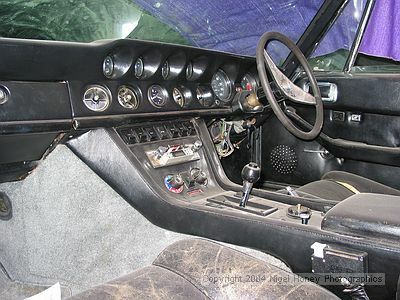 Dad had fitted a smaller carby to the car in an effort to reduce fuel consumption (but I don’t think that works, as you have to use more throttle to get the car to go at a decent pace) and the gear selector wont hold first gear, but it was doing that before it was laid up. 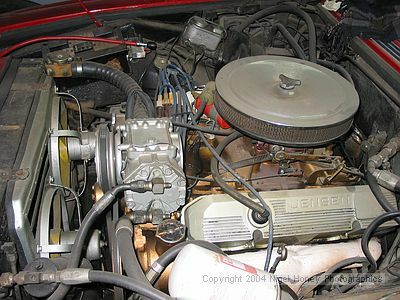 The car survived its storage very well and it was not until I started the car in 2008 that it even had a split fuel line. 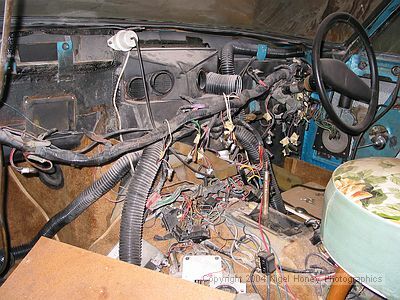 Of course I did not get around to doing much to the car. We tightened the bands in the gearbox and replaced the gasket, though they need more tightening. Changed the oil, put a new battery in and a few other bits and pieces, but then my mechanic neighbour moved, Lucas was born, my wife insisted we do the backyard first and it all became too hard. Now Lucas is a bit bigger, and the back yard is done, I said to my wife that I was going to get the car on the road, so now I am working on it again. I would like to have the car registered by summer, but we shall see how we go there. That is the target anyhow. Of course, the car will not be finished by then, but if it has new plates on it and is allowed on the road, I will be happy. 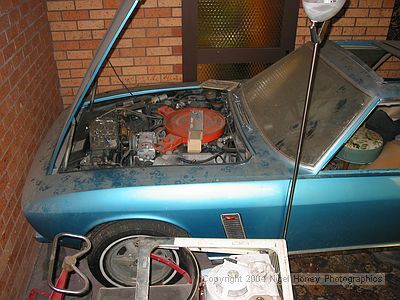 There is a bit of work in it but it will be a gorgeous car when done. 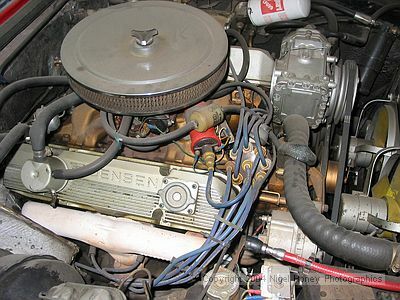 This blog is an online diary of sorts, where I can keep notes of what I have done to the car, what I have learned, and pass on any tips and information that I learn along the way. 128/4780 will also get a bit of a feature as well. 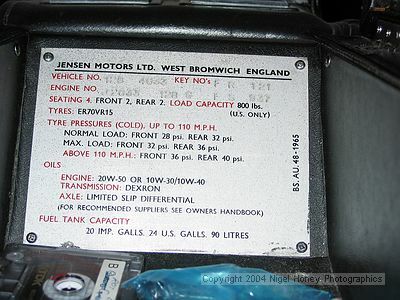 I’ll also include on the site any other information and news that is relevant to Jensen Interceptors and other Jensen cars. Hope you enjoy it.